The problem with historical fiction is that it needs heroes. History doesn't. One of my favourite places in the world is the Living Hall of the Frick Collection in Manhattan’s Upper East Side. Either side of its fireplace, crowned by a St Jerome of El Greco, hang two portraits by Hans Holbein the Younger of Henry VIII’s two great statesmen: on the left, Thomas More, to the right, Thomas Cromwell. 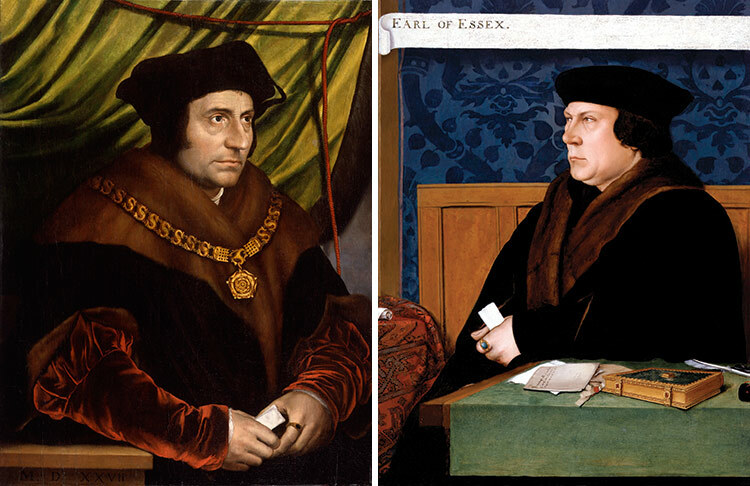 The portraits, though contemporary, already suggest the stereotypes that More and Cromwell would come to represent, in historical fiction, if not in history. More, luxuriant, confident, born to the purple, is every bit the Renaissance Man. Cromwell, jowly and clad in black, looks furtive, anxious and insecure, a man who by birth, though certainly not intellect and cunning, is out of position. Judging by reactions to the BBC’s six-part adaptation of Hilary Mantel’s novels, Wolf Hall and Bring Up the Bodies, the contest over the legacies of More and Cromwell is as bitter as ever and damaging to serious widespread engagement with this crucial period of history. Though this binary representation of More and Cromwell has a long pedigree – the Protestant propagandist John Foxe thought Cromwell a ‘valiant captain of Christ’, while More, a saint no less since 1935, has a special place in the hearts of English Catholics – it is Robert Bolt’s play of 1960, A Man for All Seasons – and, even more so, the film adaptation of 1966 – which revived this Manichean duel. More, beautifully played by Paul Schofield, was the elegant and erudite idealist, a saintly figure unconcerned with the trappings of a world with which his antagonist, Cromwell, in a wonderfully paranoid performance by Leo McKern, was all too smitten. It was a seductive but ludicrously hagiographical portrait of More, who, for all his brilliance, was a hairshirt-wearing, heretic hunter. Now, with Wolf Hall, we appear to have gone to the other extreme. Mantel’s sympathy for Cromwell appears to stem from her rejection of a Catholic upbringing and Cromwell, brilliant like More, but in reality cruel and scheming, is portrayed as a gentle family man, while the Lord Chancellor, in the form of Anton Lesser, is a vile and despicable tormentor of the blacksmith’s boy made good. However entertaining historical fiction may be, and sometimes incisive (there is a wonderfully illuminating performance by Jonathan Pryce as Cardinal Wolsey: ‘Lent to Orson Welles’s over-stuffed carnival in A Man for All Seasons’, according to Simon Schama) we see its problem. It needs heroes. History doesn’t. And history will have to wait for Diarmaid MacCulloch’s major biography of Thomas Cromwell to get the full picture, like that of the other Cromwell, warts ’n’ all.